Registered Professionals may now submit information documenting professional development, presentations given, volunteer service, employment, etc., to maintain the credential, or they may renew via examination. 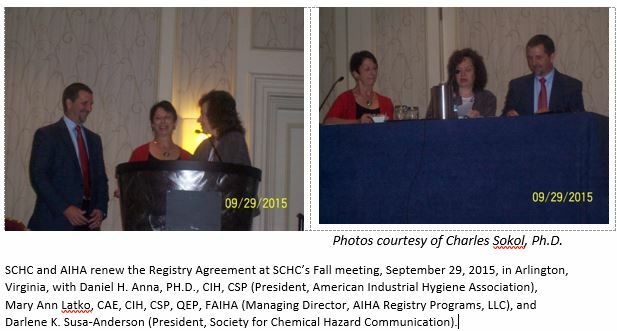 AIHA Registry Programs now offers qualified SDS and Label Authoring Registry candidates the option to take the competency assessment online via a remote proctoring solution. Candidates may schedule their preferred assessment date and time through our remote proctoring partner, ProctorU, and may use their own computer for the assessment. The SDS and Label Authoring Registry has completed a Body of Knowledge update and will be administering a new version of the assessment starting in Fall 2017. This change is planned to begin with the assessment given at the Fall SCHC Meeting. Applications are valid for one year from submittal date. The assessment/exam must be scheduled and completed within one year of application acceptance. The exams will continue to be offered at AIHA and SCHC meetings, in addition to the remote proctored option. We can also work with groups of candidates within a geographic area or within a corporation to schedule and proctor a special examination session. Contact us if you are interested in sponsoring an examination session in your area or at your company. We are excited to continue promoting the importance of the SDS and Label Authoring Registry and look forward to sharing more with you in the future.